Tracks invasive species: Monitoring helps characterize the nature, extent, and impact of AIS. Directs and improves management policies: Data from monitoring AIS are critical for prioritizing management resources and formulating effective and efficient control policies. Colonial tunicates encrusting a mussel Photo courtesy of Rhode Island Sea Grant. Invasive species are organisms (plants, animals, algae, fungi, and bacteria) that are introduced either accidentally or knowingly to an area they do not naturally inhabit, and then begin to live and reproduce at the expense of human health, economic activities, or ecological balance. These nonnative species are often introduced by human activity, sometimes accidentally, such as the Asian shore crab entering a New Jersey port in the ballast water of long-distance shipping tankers, and other times intentionally, such as plants brought in for cultivation or animals for aquarium trade that spread, escape, or are released. Water chestnut is one example of such a plant that was imported from Asia for decorative purposes and quickly spread to local freshwater bodies. Still other invasive species take advantage of changes humans have made to the landscape, such as building roads through forested areas, to expand their range. Without natural predators or other factors present that kept these species in balance in their native ecosystems, they upset the balance of the invaded ecosystem as they compete with native species for food and habitat. Consequences of invasive species can include loss of biodiversity as invasive species take resources away from native species, degradation of water quality, interference with recreational activities, damage to infrastructure, and decrease in property value—all of which contribute to downward economic trends. Marine and estuarine invasive species are of concern in Rhode Island. The state’s coastal waters are now home to several species that were introduced from Europe, Asia, and elsewhere, often from ballast water used in international shipping. 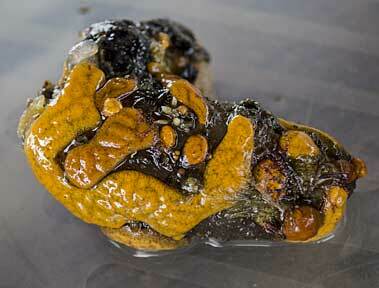 Species of concern include several types of tunicates that grow in colonies and Asian shore crabs. Colonial tunicates can smother eelgrass and shellfish beds, foul cooling water intake systems for industrial operations, and damage aquaculture operations. The Asian shore crab may feed on commercially valuable species, such as larval lobster. European green crabs, which are native to the Atlantic coasts of Europe and northern Africa, are especially known for eating soft-shelled clams—an iconic species in Rhode Island. It has been estimated that the presence of European green crabs results in annual losses of $18.6-22.6 million on the East Coast of the United States when taking into account commercial and recreational shellfishing damage and destruction of eelgrass restoration plots. Controlling and eradicating introduced species is most effective through rapid detection and response. This requires routine monitoring programs able to promptly identify recent invaders. Many fishing and swimming spots are already choked by milfoil, fanwort, water chestnut, and other invasive plants. As of 2016, RI Department of Environmental Management found at least one invasive plant present in 92 of 153, or 60%, of the lakes and ponds surveyed. In some places, invading carp are upsetting food webs at the expense of ecological balance and Asian clams are changing water quality for the worse. These invaders are often spread by boaters who do not properly clean their equipment as they travel from lake to lake, by hobbyists who improperly release aquarium and water garden stock, and by wildlife that travel among freshwater sites. Controlling invasive plants can cost $200 to $2,000 an acre of lake each year, and efforts rarely result in total eradication; consequently, those costs are incurred every year. The economic cost of not addressing the problem can also be significant. In New England, the presence of invasive species in a lake can reduce property values up to 43%. Routine monitoring programs allow early detection and rapid response to invasive species, by far the most effective management strategy. 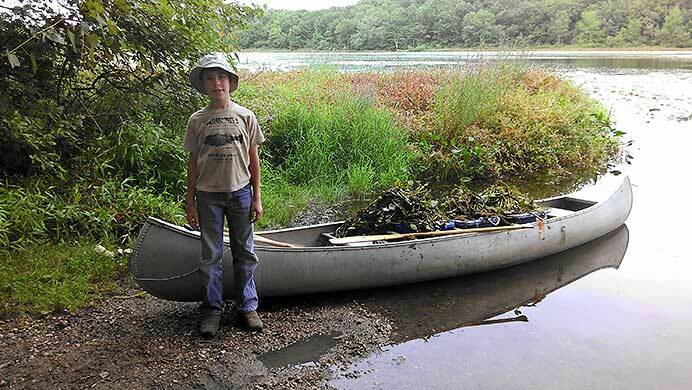 Sam Gregg volunteers to help harvest invasive water chestnut from Belleville Pond, N. Kingstown. Photo courtesy of RINHS.